Bangkok is starting to become all too familiar now, and I can tell because aside from memorizing the BTS stations (and the train announcement spiel for each station), I’m not taking as much picture as I used to. I met up with Ming again for lunch. It was supposed to be another food trip on the cheap around Silom, but since one of his friends suddenly became part of the lunch party, we ended up at a Japanese restaurant. The food was pretty good, but it made me miss Little Tokyo in Makati. No pictures of the food as well, because aside from the poor lighting, I suddenly felt odd bringing out my camera and taking photos of my food. 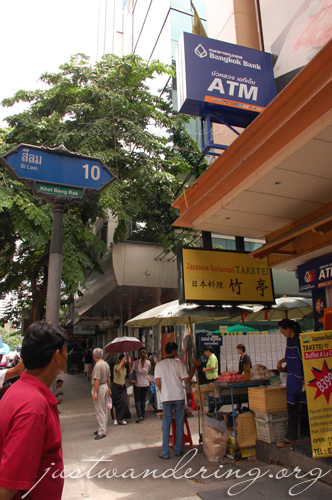 After lunch, I walked down the length of Silom road towards Naradhiwas Rajanagarindra Road to look for the street that leads to the ITF Market. I took photos of the landmarks for future reference. 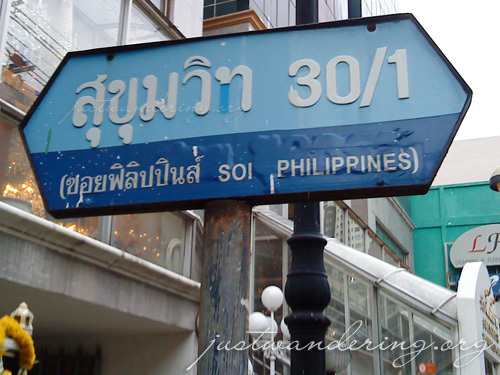 If you want to go to this market, it’s on Silom Soi 10. Photos taken, I walk towards the intersection and crossed the road to get on a taxi that will take me to Yaowarat, or Chinatown. I was back in Mangkorn street, buying up some dollie stuff. It’s rather unfortunate that I found this doll shop, because after discovering the store, I’ve no interest in exploring Bangkok’s Chinatown more. After making my purchase, I went back out to Yaowarat Road and hailed a taxi to Central World. I initially wanted to walk towards the Chao Phraya River and take the river express to Thong Sala, but it started drizzling, and I don’t want to get soaked while lost in the middle of Chinatown. Just how big is Blythe in Thailand? They have hair product boxes featuring the dolls. And they don’t even grow hair. Of course, taking the taxi meant enduring the traffic. This is the second taxi ride I’ve had since I arrived from Vientiane. The taxi ride then was fast, as the roads were pretty much deserted. Though the ride from Silom to Chinatown was fairly good, traffic was quite heavy when we reached Yaowarat Road. It was traffic going out as well, and even more so when we were nearing the Siam area. 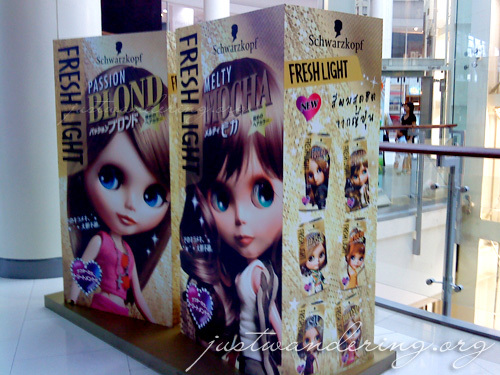 The reason I wanted to go back to Central World is to check out the doll items they have for sale and to look for a pad thai mix. My sister-in-law is requesting that I cook pad thai while I’m staying with them in Singapore. I did find a mix, but the only one available is in a bottle. I can secure the bottle inside my backpack with some clothes to protect it from getting smashed, but I don’t want to risk it. Seems like I’ll just have to find the mix in Singapore. I didn’t buy any doll stuff in Zen world either. The prices of the things they have for sale are much more expensive than the ones being sold in Chinatown. However, they also have items that I didn’t see in Chinatown, so if you’re in the lookout for Blythe clothes in Bangkok, Zen World is a good place to start. I went back to the hostel, and after dropping my things and changing into more comfortable clothes, I headed back down to the street for an early dinner. However, before I sat down to eat, I walked around the neighborhood first. Well, I just wanted to see the Philippine Embassy, actually. It was a fair walk to the embassy, and I was tickled to see it in the corner of Sukhumvit Road and Soi Philippines. I crossed the road to walk back to Soi 38. At one crossing, I was wondering why people are all standing up at attention, and why one side of the road was completely empty. A patrol car drove past, followed by a black car with very dark tint, and a couple more cars. As soon as the last car passed, everybody started moving again. Must be somebody very very important. I stopped by the chicken rice stall I had dinner at the other night and had it with fried chicken. The whole day I’ve been wondering about my plans for Malaysia. I’ve initially planned on staying until the end of June, but as my trip progresses, the date to go back to Singapore has been moving backwards. First I thought I’d go back on the 29th, so I can rest on the 30th before going back to work on July 1st. Then I thought 27th might be better, so I’d also have time to go to the places I planned to visit on Day 1. Now, I’m currently settled on June 26th. It’s my sister-in-law’s birthday, and to celebrate, the family will be spending the weekend at a hotel. I figured that’s the best time for me to go back to Singapore, so I can quarantine myself while they’re away. The problem now is.. how to I cram a trip to Malaysia in just 7 days? thanks for the directions to the ITF market!